10W FAST CHARGER: Compare to most of chargers in the market that only support 5W charging, this wireless car charger supports 10W Fast Charge mode (10% faster than standard 5W wireless charger) for devices like Samsung Galaxy S9, S9 Plus S8, S8 Plus, S7, S7 edge, S6 edge+, Note8; 7.5w fast charge iPhone XS, iPhone XR, iPhone X, iPhone 8, iPhone 8 Plus. 5W standard charge all other Qi-Enable devices. SAFE DRIVING: Unlike other chargers mounted on the dashboard or windshield, our wireless charger is mounted on air vent, compatible with most car air vent. Most importantly, it will not block your line of sight while you are driving. DROP AND CHARGER: With the aid of gravity design, simply slip your phone onto the wireless charger mount; the two arms will automatically embrace and hold your phone steadily even on a bumpy road. One hand operation, drop and charge, done with one second. Save you from the tangled locating cords or cables. 2-IN-1 CHARGER: It combines a fast wireless charger and a phone holder. While your phone is out of battery when you’re on the way, at that moment this wireless charger is a solution to meet your urgent need. 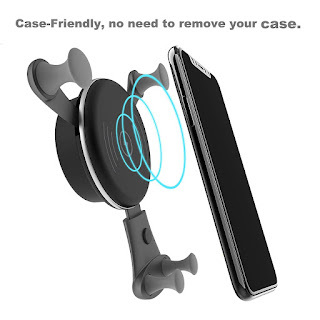 It is also a phone holder, which is easy and safe for you to grab your phone like using GPS navigation while you’re driving. SAFE PROTECTION: Built-in intelligent chip with multiple protections, such as overcharge, overcurrent, short-circuit, temperature control etc. It will automatically stop charging while the phone is fully charged, and will start charging again once the battery drop from 100% to 99%, making sure a full-charged battery for you to go.